When the odds are against you, Champion Generators can help you beat those odds and come out on top. One never knows when one will need some backup source of electrical power, so generators are good to have in the home. Generators are also great for work sites where you dont have a connection to the grid, enabling you to use your tools without worries. Disasters can come in many forms, and a lot of them can conceivably cut power lines and leave you in the dark. With Champion Generators, you can be sure that you will have electricity to tide you over until the power comes back on or is reconnected. Be prepared, and you wont regret anything. For light duty, the Champion 1200 Watt Portable Generator is an excellent choice. There are several models under this classification, and they share many characteristics. They also have a 1500 watt starting wattage. Some models are EPA and CARB certified, meaning they produce no more than the acceptable level of exhaust and noxious fumes. This is a good choice for keeping the lights on and charging up electronics when accompanied by an inverter unit. The Champion 3500 Watt Portable generator is a more powerful variant, suitable for medium home use or RV or trailer use. Its easy to wheel around and rugged enough to stand frequent use. This one is not CARB compliant, so it is not available for sale in California. Theres also a model with push-button electric start, and even wireless remote start. The wireless start model is rated at a noise level of 68 decibels, which is a relatively low level of noise  enough to keep curious woods animals at bay but not enough to keep you awake. The built-in 3-prong connection also makes it easy to hook up to your RV or trailer, ensuring reliable and hassle-free power with less noise. When you need some real power, the Champion 4800 Watt Portable Generator options can make it happen. While these run at 4800 watts, they can provide 5500 watts of starting power for heavier machinery. A 120/240 voltage selector (not available on all models) gives you the flexibility to plug in and power up a wider range of devices. Again, not all of these are EPA and CARB certified, so make sure to check the details for individual models. When you need a real workhorse to power your heavy equipment, then look no further than Champion Power Equipments heavy duty models. Ranging from 6000 watts to 7200 watts of running wattage, many of these provide boosts of power for starting heavy machinery. The 7200 watt units can provide a whopping 9000 watts of starting power. Dont let power outages destroy your productivity and throw you off schedule. Whether in emergencies, or just everyday applications, Champion Generators are reliable and very affordable, especially when compared to certain other brands. These are essential, stripped-down, but nonetheless effective and efficient All-American generators. You will certainly want this champion on your side. 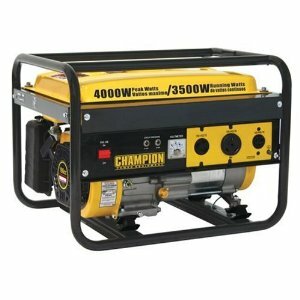 Return From Champion Generators Page to Home - Finishcarpentryhelp.com.